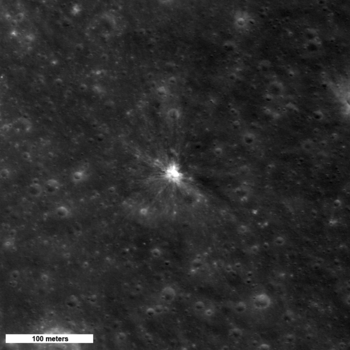 This news is no surprise, but I think it's the first such discovery I've heard of: the Lunar Reconnaissance Orbiter Camera (LROC) team has identified a new crater on the Moon, one that wasn't there when Apollo 15 flew over, and which doesn't correspond to any known human artifact impact site. Therefore it's a fresh crater that's formed in the last 38 years. And since the comparison slide they posted with this item has a filename including the string "candidate3," I'm sure there are others yet to be announced! Since this crater is not visible in images from the Apollo 15 mission, it formed sometime in the last 38 years. The new crater is only ~10 meters (30 feet) across, but its bright ejecta extends much farther, making it stand out from all the nearby craters. 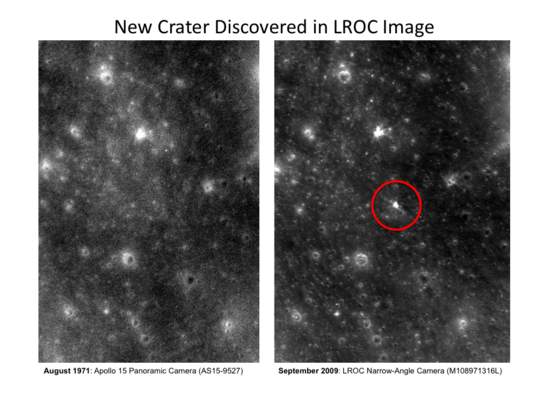 Comparisons of images from the Apollo Panoramic Camera and the LROC Narrow Angle Camera are revealing impact craters that have formed within the past 38 years. 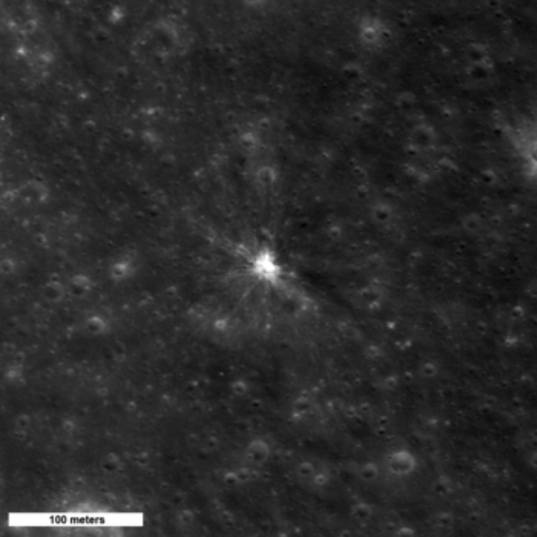 The Apollo image (AS15-9527) was taken in August 1971 with the sun 64° above the horizon. The LROC image (M108971316L) was taken September 30, 2009 when the sun was 72° above the horizon. Images taken under similar lighting conditions like these are the most useful for identifying and comparing surface features. This is real needle-in-a-haystack work, so congratulations to whomever it was who spotted it -- and the other two "candidates" there must be besides this one!